A new research report suggests school principals recognize the great value of strengthening students’ Social and Emotional Learning (SEL) skills in their schools, and most are moving forward in this work. However, the study’s findings suggest principals need better ways to assess and measure SEL skills and greater support and training for their teachers to make their SEL initiatives successful. Below are high level takeaways from a new Collaborative for Academic, Social, and Emotional Learning (CASEL) report prepared by Civic Enterprises with Hart Research Associates entitled Ready to Lead: A National Principal Survey on How Social and Emotional Learning Can Prepare Children and Transform Schools. The report is based upon a comprehensive survey of 884 pre-K to 12 school principals across the US. The findings of this report can be broken into two general categories: What do principals already know and do, and what do they need to be more effective? What do Principals Already Know and Do? → They know the value of teaching SEL to all students. 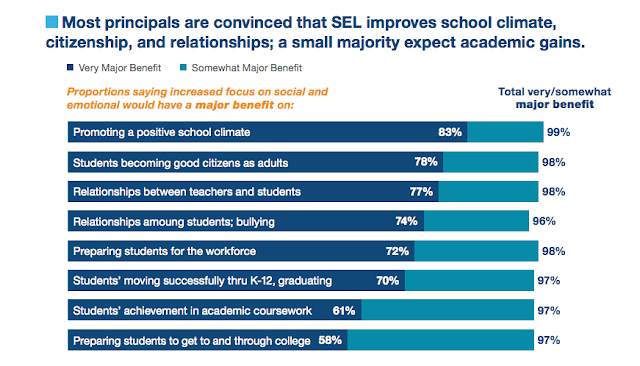 Principals see many positive outcomes from strengthening students SEL skills. See the table below. 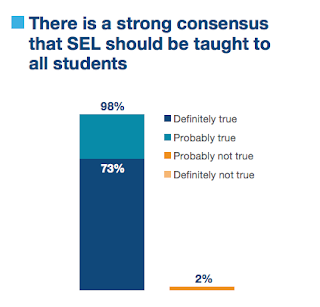 Schools meeting SEL programmatic quality benchmarks report two important components: strong support from their district office and wide involvement of all stakeholders. Perhaps not surprisingly, principals in districts which place a great deal of emphasis on SEL are more than twice as likely to report they are implementing SEL systematically, as compared to districts where principals report little such emphasis. And principals in high performing SEL schools are nearly three times as likely to have high expectations of teacher and parent participation, when compared to low performing SEL schools. 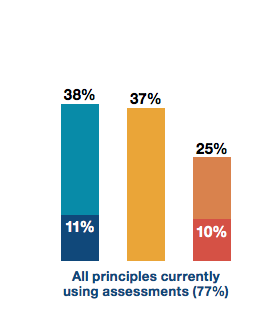 What do Principals Need to be More Effective? → A better measure and assessment of SEL skills. But these beliefs about the power of SEL assessment are not being acted upon, and one reason is a lack of awareness of the tools that are available. → To provide greater support and training to teachers in SEL instruction and data usage. Another area of great demand is in training for teachers, both in how to implement SEL in their classrooms, and in how to use SEL assessment data in their instruction. 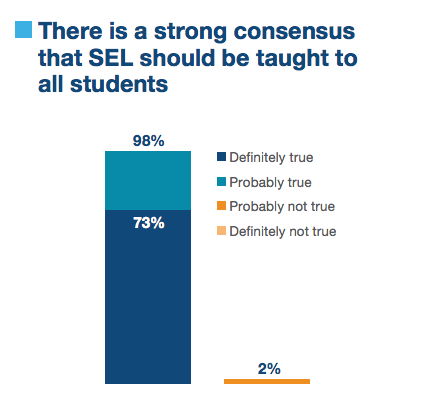 What Principals know—that effective SEL programming and assessment greatly benefits their students—and what they need—better assessments and more training for teachers— is clear from this report. 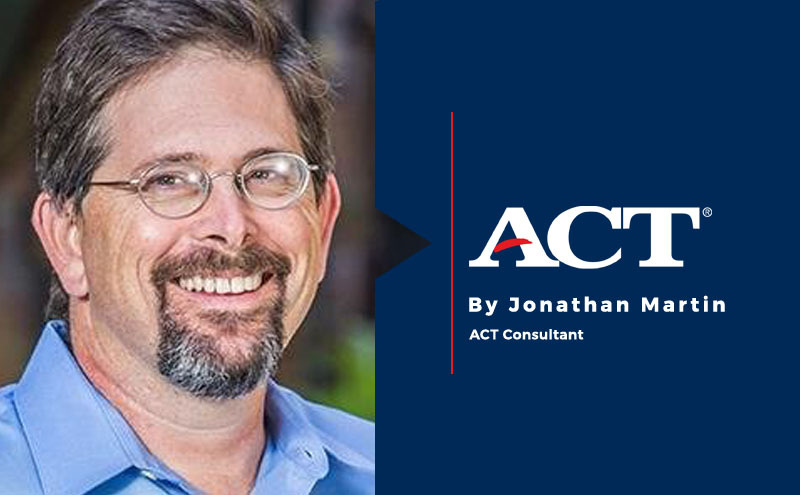 ACT® is expanding the resources for SEL assessment and instruction that principals are seeking. A state of the art innovative assessment system, ACT Tessera™, for accurately measuring key SEL skills in students. Lesson plans and activities for teaching key SEL skills are part of the ACT Tessera Teacher Playbook. SEL consulting is available from ACT.ACT experts will meet with your school or district educators to advise a SEL program development, train teachers in the ACT Tessera Playbook instruction, and recommend general SEL best practices. To start the conversation email ACTConsultingServices@act.org.